The ready mix concrete process consists of six steps that turn the required ingredients of a mix into the perfect batch of concrete for a particular application. 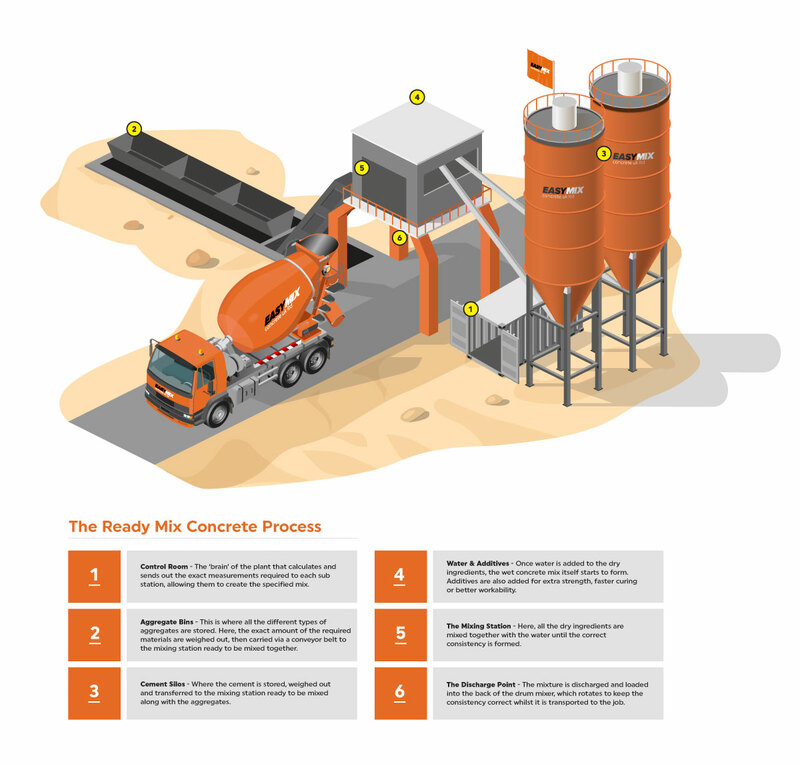 In this infographic, the team at EasyMix will run through these steps to give you a clear idea of what happens in the time between you placing your order and your concrete arriving at your site. 1) Control Room – The ‘brain’ of the plant that calculates and sends out the exact measurements required to each sub station, allowing them to create the specified mix. 2) Aggregate Bins – This is where all the different types of aggregates are stored. Here, the exact amount of the required materials are weighed out, then carried via a conveyor belt to the mixing station ready to be mixed together. 3) Cement Silos – Where the cement is stored, weighed out and transferred to the mixing station ready to be mixed along with the aggregates. 4) Water & Additives – Once water is added to the dry ingredients, the wet concrete mix itself starts to form. Additives are also added for extra strength, faster curing or better workability. 5) The Mixing Station – Here, all the dry ingredients are mixed together with the wet ingredients until the correct consistency is formed. 6) The Discharge Point – The mixture is discharged and loaded into the back of the drum mixer, which rotates to keep the consistency correct whilst it is transported to the job.